If you own an iPhone and you’re in the market for a really, really great smart lock, today is your lucky day. 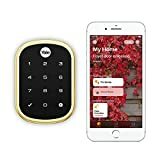 Amazon has shaved a healthy $40 off the Yale Assure Lock SL with iM1, which is Yale’s latest and greatest HomeKit enabled smart lock. Apart from being beautiful, the Yale Assure Lock SL is also best in class when if comes to functionality, allowing you to use your phone or a PIN code to unlock your door. You can’t use a key though, because this awesome lock doesn’t even have a keyhole. Grab it while it’s discounted, and note that you may need to dive into the “other sellers” section on the Amazon page to get the lower $219.99 sale price.